First of all depression is not abnormal. Nearly a quarter of all people will experience depression at some time in their lives. This book also tackles the myth that medication is the best treatment for depression describing how bans against advertising to the public were lifted and drug companies began marketing antidepressant medications directly to consumers making an emotional appeal suggesting that a normal life isn’t possible unless the consumer uses medication. These advertisements have meant that more people are being diagnosed with depression and more people are being prescribed medication for depression – which let’s face it puts more money in the pockets of the drug companies. The authors in this book work on the belief that depression means that something is out of balance in your life and is a call to action to bring things back into balance. 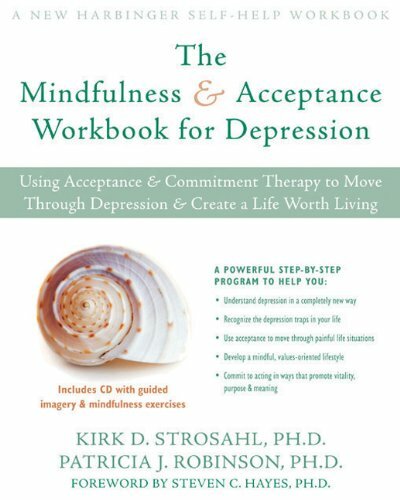 The authors of this book recommend a mindful and intentional approach to daily living based on acceptance much like the one that we practice in yoga. They also recommend engaging in actions designed to solve problems rather than avoid them. One the of areas that people with depression get stuck is with inertia, I know. Migraines. Inertia. Yoga. Yoga for Depression. DVD, Digital Download, Membership Site. Previous post: Can I practice yoga on a full stomach? Next post: Can I do Inversions in Yoga When I’m menstruating?